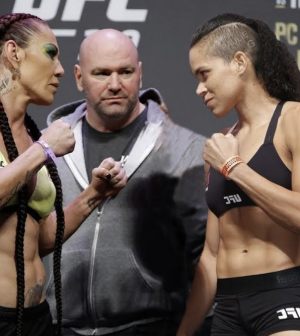 A highly anticipated super-fight between UFC Women’s bantamweight champion Amanda Nunes and UFC women’s featherweight champion Cris “Cyborg” Justino will take place on December 29th at the T-Mobile Arena in Las Vegas for UFC 232. Cyborg’s women’s featherweight title will be up for grabs. Nunes (16-4) has won her last seven UFC fights and successfully defended her bantamweight belt three times since beating Miesha Tate via rear naked choke at UFC 200 in July 2016. Her most recent bout was a TKO victory over Raquel Pennington at UFC 224 back in May. Justino, 33, hasn’t lost a single fight since making her pro MMA debut in 2005. Since joining the UFC in May 2016, she has won all five of her fights. She took home the featherweight title against Tonya Evinger at UFC 214 in July 2017, and has successfully defended her belt twice.